Collins & Lacy, P.C. 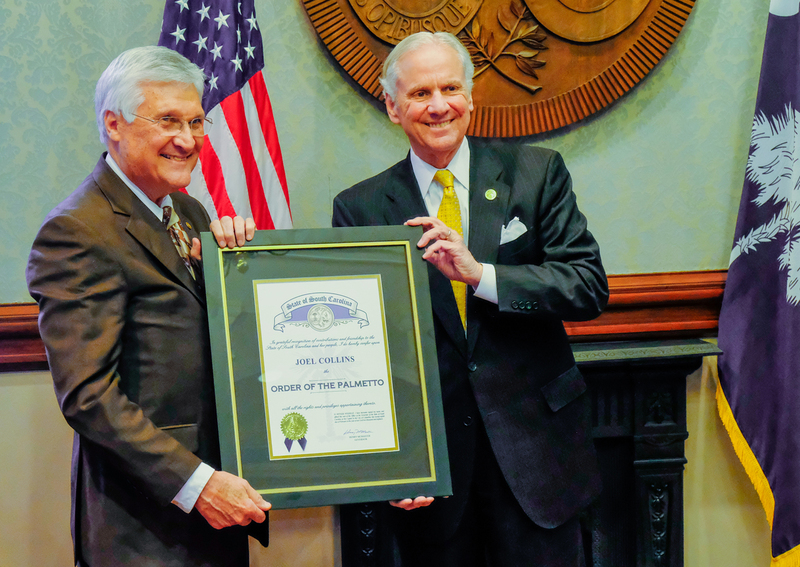 is honored to announce that co-founder, Joel W. Collins, Jr., has received the Governor’s Order of the Palmetto award, the state’s highest civilian honor. Since 1971, it has been awarded to citizens for remarkable service and contribution to South Carolina and her people. Collins co-founded the law firm of Collins & Lacy in 1984 along with Stan Lacy, and he has devoted his practice to professional liability law, white-collar criminal defense and complex civil litigation. Collins has been consistently honored by South Carolina Super Lawyers© and Best Lawyers in America©, two of the oldest and most respected peer-reviews in the legal profession. He has volunteered his time to numerous professional associations and community causes, and has held leadership positions in local and national civic organizations including Rotary, the National Safety Council, and the American Board of Trial Advocates (ABOTA) Foundation. Since 2010, Collins has taught a U.S. Constitution course at the University of South Carolina Honors College as an Adjunct Professor. He has also helped establish scholarships and pre-law societies at Clemson University, Wofford College, Winthrop University, and The Citadel.